Much as witch-hunts were about perpetuating threats so is our war on terror. We've know for some time that drone strikes create more terrorists than it kills. A recently leaked document by Wikileaks show that the CIA knew that Drone strikes are 'counter-productive' and increase support for insurgents. Didn't we already know that? Come on! "The syndrome the Bush administration created in Iraq was what former Pentagon critic Chuck Spinney has called a “self-licking ice cream cone”: the measures to fight the war on terrorism guaranteed more terrorists, which in turn guaranteed the agencies more money to fight the war on terrorism. The same process was at work with respect to torture and drone strikes. It is a great business model for contractors and bureaucratic empire builders, but far less favorable as a national survival strategy." Chuck Spinney interviewed by Bill Moyers: here. The PTB (Powers That Be) want you to feel afraid, powerless, desperate and apathetic. Don't fall for that. Stay positive! These systems of power were built by humans and they can be dismantled by humans. DENVER (AP) -- Ten sheriffs from three different states sued Colorado Thursday for legalizing marijuana. The sheriffs from Colorado, Kansas and Nebraska say that Colorado's 2012 marijuana legalization vote violates federal law and shouldn't be permitted. The lawsuit is the latest legal challenge to legal weed. Separately, Nebraska and Oklahoma have appealed to the U.S. Supreme Court to strike down marijuana legalization in Colorado. The Supreme Court hasn't said yet whether it will hear that case. The sheriffs note that more than half of Colorado's recreational pot sales last year were sold to out-of-state visitors, according to data from Colorado's marijuana regulators. The sheriffs say the weed is spilling across state lines. Even in Colorado, the sheriffs say, legal weed forces police officers to violate federal drug law. Colorado's attorney general, which will defend the state pot law in all three lawsuits, did not immediately respond to the sheriffs' filing Thursday. An interview with Debbie Bookchin on her father’s contributions to revolutionary theory and the adoption of his ideas by the Kurdish liberation movement. PRINCETON, N.J.—Tariq Ali is part of the royalty of the left. His more than 20 books on politics and history, his seven novels, his screenplays and plays and his journalism in the Black Dwarf newspaper, the New Left Review and other publications have made him one of the most trenchant critics of corporate capitalism. He hurls rhetorical thunderbolts and searing critiques at the oily speculators and corporate oligarchs who manipulate global finance and the useful idiots in the press, the political system and the academy who support them. The history of the late part of the 20th century and the early part of the 21st century has proved Ali, an Oxford-educated intellectual and longtime gadfly who once stood as a Trotskyist candidate for Parliament in Britain, to be stunningly prophetic. For information about Tariq Ali’s new book, “The Extreme Centre: A Warning,” click here. The Pakistani-born Ali, who holds Pakistani and British citizenships, was already an icon of the left during the convulsions of the 1960s. Mick Jagger is said to have written “Street Fighting Man” after he attended an anti-war rally in Grosvenor Square on March 17, 1968, led by Ali, Vanessa Redgrave and others outside the U.S. Embassy in London. Some 8,000 protesters hurled mud, stones and smoke bombs at riot police. Mounted police charged the crowd. Over 200 people were arrested. The devolution of the political system through the infusion of corporate money, the rewriting of laws and regulations to remove checks on corporate power, the seizure of the press, especially the electronic press, by a handful of corporations to silence dissent, and the rise of the wholesale security and surveillance state have led to “the death of the party system” and the emergence of what Ali called “an extreme center.” Working people are being ruthlessly sacrificed on the altar of corporate profit—a scenario dramatically on display in Greece. And there is no mechanism or institution left within the structures of the capitalist system to halt or mitigate the reconfiguration of the global economy into merciless neofeudalism, a world of masters and serfs. The battle between popular will and the demands of corporate oligarchs, as they plunge greater and greater numbers of people around the globe into poverty and despair, is becoming increasingly volatile. Ali noted that even those leaders with an understanding of the destructive force of unfettered capitalism—such as the new, left-wing prime minister of Greece, Alexis Tsipras—remain intimidated by the economic and military power at the disposal of the corporate elites. This is largely why Tsipras and his finance minister, Yanis Varoufakis, bowed to the demands of European banks for a four-month extension of the current $272 billion bailout for Greece. The Greek leaders were forced to promise to commit to more punishing economic reforms and to walk back from the pre-election promise of Tsipras’ ruling Syriza party to write off a large part of Greece’s sovereign debt. Greece’s debt is 175 percent of its GDP. This four-month deal, as Ali pointed out, is a delaying tactic, one that threatens to weaken widespread Greek support for Syriza. Greece cannot sustain its debt obligations. Greece and European authorities will have to collide. And this collision could trigger a financial meltdown in Greece, see it break free from the eurozone, and spawn popular upheavals in Spain, Portugal and Italy. Read page 2 here and page 3 here. Without a collective voice of the whole citizenry to speak wisely and powerfully in our public life, we have become impoverished and imperiled. We need to change that—soon. Our children—and their children’s children—need us to create this powerful collective voice, because it is their voice too. They need us to ensure that it is wise and heeded, because we and they urgently need our politics and our governance to become sensible, sustainable, creative, and just. Our times are perilous. Nearly everything we love is at stake. Thomas Paine once said, in his revolutionary pamphlet Common Sense, “We have it in our power to begin the world again.” It is so, even now. It is worth noting that Voice of the People’s Advisory Board includes twelve former Members of Congress from both sides of the aisle, as well as other former federal and state government officials. It also includes leading public opinion researchers, business leaders, academics and scholars, including a Nobel laureate. The Center for Deliberative Democracy, housed in the Department of Communication at Stanford University, is devoted to research about democracy and public opinion obtained through Deliberative Polling®. Deliberative Polling®, developed by Professor James S. Fishkin, is a technique which combines deliberation in small group discussions with scientific random sampling to provide public consultation for public policy and for electoral issues. A number of Deliberative Polls have been conducted in various countries around the world, including China, Japan, Britain, Italy, Bulgaria, Brazil and in the United States – some national and some local. Let me tell you what keeps me optimistic, though cautiously so, and I wish others can join me in this. Is here any doubt that this system is brittle--hard but fragile? Look at how terrified they were of Occupy, enough to come down hard on predominantly white young people with force because it was POLITICALLY threatening, like the sixties mass mobilizations against the war which deeply affected the guys and women in uniform to the point of ineffectiveness. Long ago I adopted a dialectical way of looking at history--long period of quantitative change that suddenly, like a breaking wave that has traveled maybe thousands of miles across open ocean, becomes a qualitative change that leads a disintegration of the existing order. That happened in a positive way (from my perspective) in 1917, 1949, 1959, 1970, 1990, 1998. These were the years of victorious revolutions, either by force of electoral process. However, these gains have in many cases been sabotaged and reversed. But the "game" is still on. The empire is literally UNSUSTAINABLE. It will come to an end, but how and when are the big questions. That is up to us, the people of the world. Now is not the time to allow despair to win. I have a name for the process we must embrace: REVEL-ution--the conscious and exuberant dismantling of the structures of oppression. It was happening in Egypt, in Wisconsin, in Occupy, and is continuing in Venezuela and Cuba. Join it! Did you know that currently there is in Hawai'i a genuine national liberation struggle for full sovereign independence? Did you know that the US claim to its sovereignty is BOGUS, even today, "statehood" notwithstanding? See www.liberatehawaiithebook.com for more information. This is the "dark hour before dawn." As we used to say in the sixties, "Can you dig it?" REVEL-ution is groovy! March 1, 2015, 10:36 AM | House Speaker John Boehner, R-Ohio, says Congress has "every right" to invite Israeli Prime Minister Benjamin Netanyahu. March 1, 2015, 10:47 AM | Sen. Dianne Feinstein, D-California, discusses Israeli Prime Minister Benjamin Netanyahu's upcoming speech before Congress. Tensions between the White House and Benjamin Netanyahu escalated Wednesday as top administration officials condemned the Israeli prime minister’s plan to address Congress next week and Netanyahu accused six world powers, including the United States, of “giving up on their commitment” to prevent Iran from obtaining a nuclear weapon. The unusually public spat marked one of the lowest points in a relationship that has long bonded the two countries. Although the new round of recriminations reflected the frosty personal relations between President Obama and Netanyahu, it came at a critical juncture in multilateral talks designed to prevent Iran from using a civilian program to develop a nuclear weapon. The prime minister has said the unfolding deal — to which Iran has not yet agreed — could pose an existential threat to the Jewish state. Obama, however, considers a deal a potential legacy that could ease nuclear tensions, lift trade restrictions on Iran and alter the region’s strategic calculus. Congressional Democrats have been caught in the middle of the dispute. On Wednesday, Sen. Timothy M. Kaine (D-Va.) became the fourth senator to say he would skip Netanyahu’s speech, calling its timing “highly inappropriate.” Several members of the House also have said they will boycott the speech. The latest volley of high-level criticism began when national security adviser Susan E. Rice, appearing Tuesday night on “Charlie Rose,” condemned Netanyahu’s decision to accept the invitation of House Speaker John A. Boehner (R-Ohio) to appear at a joint meeting of Congress shortly before Israel’s elections. At a Likud political convention in the Maale Adumim settlement just east of Jerusalem, Netanyahu fired back. “I respect the White House and the president of the United States, but on such a critical topic that could determine whether we exist or not, it is my duty to do everything to prevent this great danger to the state of Israel,” he said. Congress could play a critical role in the Iran talks. It is weighing whether to add new sanctions to the current ones. The existing sanctions, and those adopted by the European Union, are widely viewed as having helped push Iran to the bargaining table. But Obama has vowed to veto any new sanctions and has urged Congress to wait at least a month for the outcome of the negotiations. Obama has said that if the talks fail, he will move to tighten economic restrictions. Secretary of State John F. Kerry defended the administration’s negotiations in testimony before the House Foreign Affairs Committee — and took a swipe at Netanyahu. 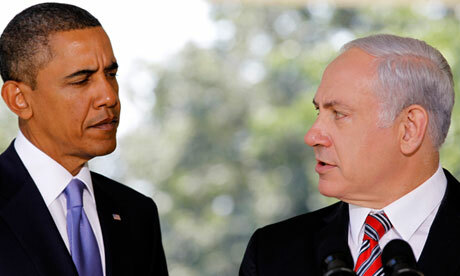 No love has been lost between Obama and Netanyahu. He said that earlier tensions preceded incremental peace accords but that Obama and Netanyahu remain far apart on basic issues and that Kerry’s efforts to bring Israel and Palestinians together failed. Now their personal tensions have put Democratic lawmakers in awkward positions that threaten bipartisanship when it comes to Israel. Democrats have been wrestling over whether to boycott the speech, as senior Obama administration officials plan to do. 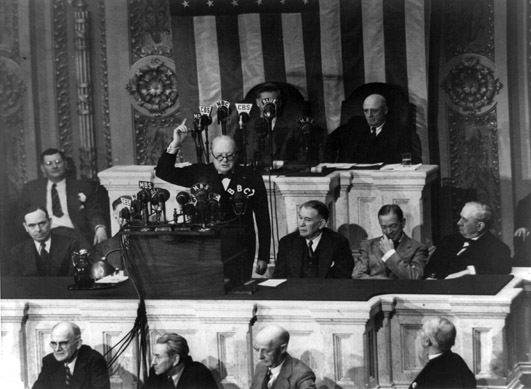 This will be the third time Netanyahu has addressed the full Congress, tying Winston Churchill’s record. Because Netanyahu did not arrange his visit through the White House, Obama has said that he will not meet with him, and Vice President Biden has made plans to travel abroad. “This puts Democrats in a position where they have to choose between their support for Israel and their Democratic president — and do it in a very visible way,” said Martin Indyk, a vice president at the Brookings Institution and a former U.S. ambassador to Israel. Kaine will join Senate colleagues Patrick J. Leahy (D-Vt.), Bernard Sanders (I-Vt.) and Brian Schatz (D-Hawaii) in skipping the address. According to an unofficial estimate by one Senate Democrat, about 30 members of that caucus are expected to attend the speech and nearly 15 others are still deciding whether to boycott. One such Democrat is Sen. Chris Murphy (D-Conn.), a freshman who serves on the Foreign Relations Committee. “It’s really offensive, but I think it’s a protocol breach, not a policy break,” he said. The American Israel Public Affairs Committee (AIPAC), which said it didn’t know about Netanyahu’s plans ahead of time, said lawmakers should put aside the protocol issues and listen to the prime minister’s message on the Iran talks. Meanwhile, leaked details about Iran nuclear negotiations have made many lawmakers more interested in what Netanyahu has to say. “I think his voice will resonate more credibly if that’s the deal that’s in the making,” said Abraham Foxman, national director of the Anti-Defamation League. “Both the president and prime minister share the goal of preventing Iran from going nuclear. How to get there is what separates them.” Foxman initially called Netanyahu’s speech “ill-advised” but now says he will attend. Many will hear Netanyahu on Monday, when he addresses the annual AIPAC convention. AIPAC expects 16,000 people to attend, including about 50 lawmakers. Katie Zezima and Mike DeBonis in Washington and William Booth in Israel contributed to this report.